Well, guess what I was doing all day? I guess the Post Title kinda gave it away, huh? I woke up this morning bound and determined to finish our bedroom. I thought I'd take some pictures for you! we wanted the room to have an island get-away feel. 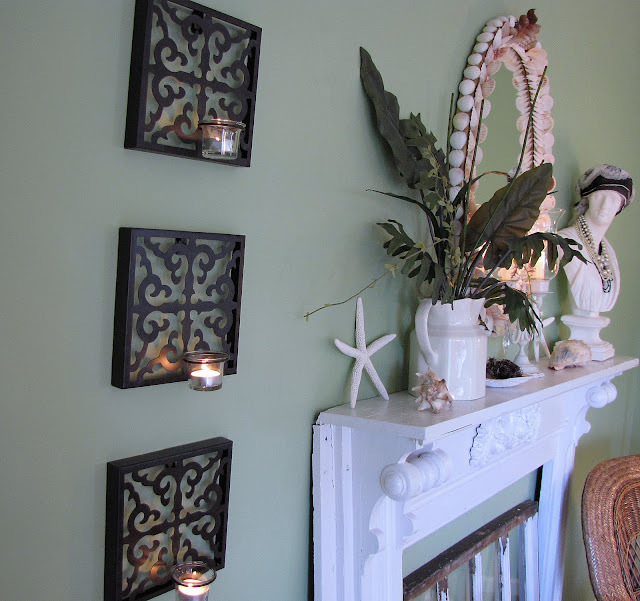 silver picture frames, the scrolly wall sconces by the mantel. The cedar chest at the foot of the bed belonged to my maternal grandmother. Once I finished gathering all the rest of the decor, I was able to finish the room. as were the marble lamps. I remember them in her home when I was a child. They are beautiful reminders of love passed down from her to me. When our oldest daughter gets a home of her own, they will go to her. Loot from beach-combing through the years. Mostly on Southeastern, USA beaches. I am reading "A Tree Grows in Brooklyn". 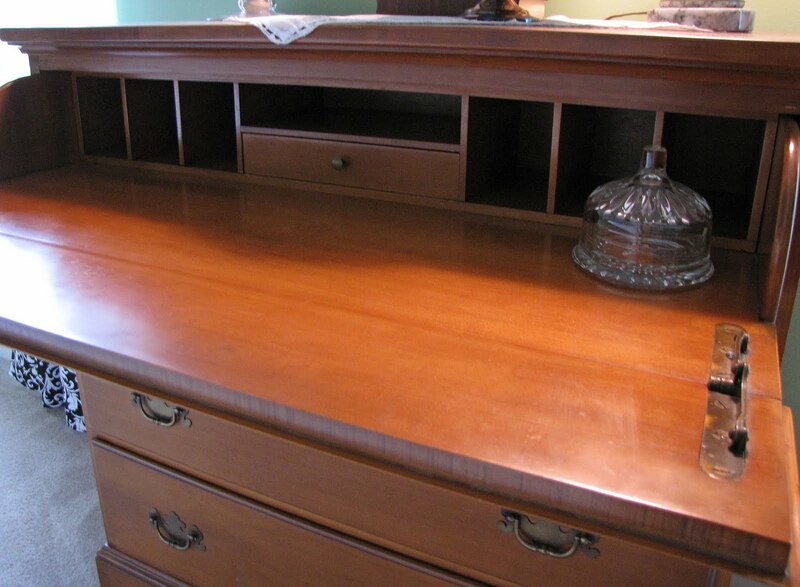 opens to reveal pigeon holes and a drawer inside. It slides out, also, as a writing surface. It was a gift from my mother-in-love. The sitting area opposite the bed. 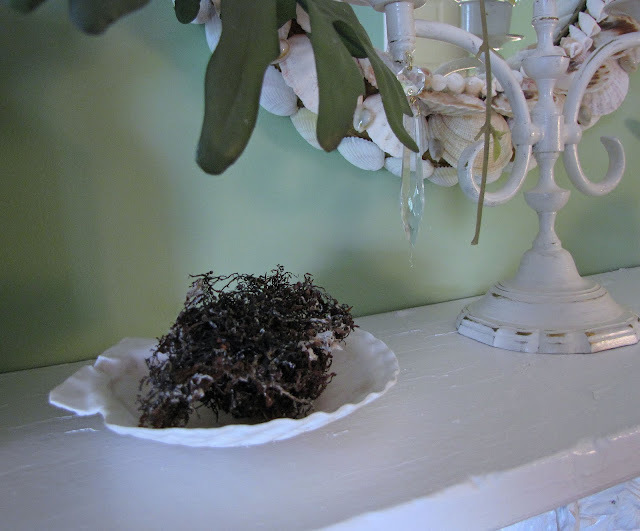 Our salvaged mantel, and other finds welcome you to this side of the room! and the old window, a yard sale find for $5. Lemonade made by my younger daughter. Our bedroom is on the third floor. Our backyard trees, right outside the window, are as tall as the house. So, it feels as if we are sleeping in the trees. Leslie, it is so beautiful! The story of those family/friend treasures are simply wonderful. You have everything placed so beautifully. Truly a sanctuary. And can I just say, "that room is huge!" I love love love the mantle and the drapey stuff over your bed and the trees!!!! I noticed those before you mentioned them. How nice to sleep so high above everything! Thank you for the tour! And kudos to you for getting it done! I'm right behind you with my entry way. I'm hoping to have it all ready for Friday! I so loved the tour and cannot decide what my favorite part is...just beautiful! I know you are loving it! The bed is dreamy and I love the cedar chest, the nightstands are great and the passing down of them, the accessories are just perfect. It is a beautiful room! Oh and I love the mantle and old window and the honeymoon momentos. And the Cottage Living magazines...that was a good one...shame it went away. Is this your favorite spot right now? Everytime I fix up something in my home it becomes my favorite spot. You're inspiring me to get moving on my own bedroom project...I've gotten as far as painting the headboard...more to come on that! Beautiful! But I've come to expect no less! Everything is just so pretty! I love all the shells, and the Mr. and Mrs. signs . 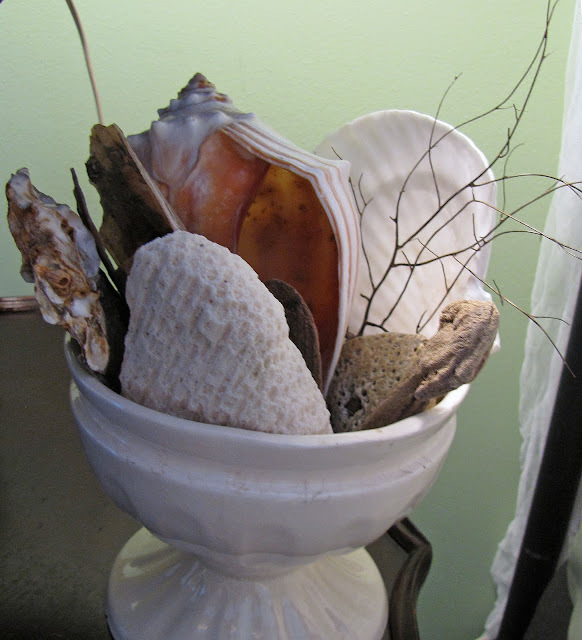 . . and you've got me wanting to dump the eggs out of my apothecary jar & fill it with sand & shells. 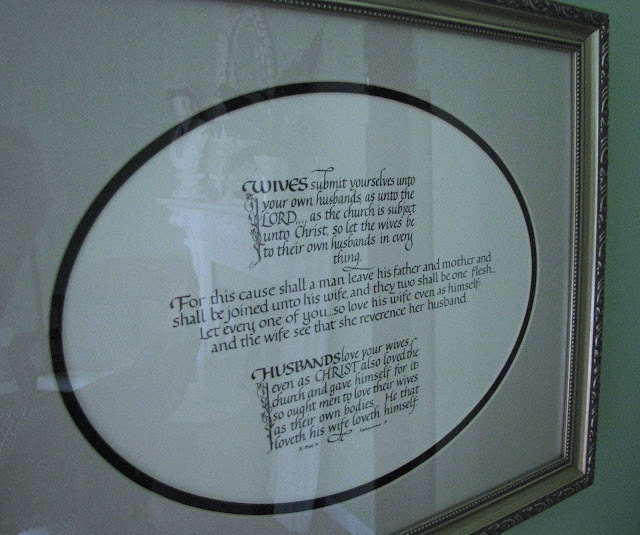 I love the framed Bible verses, too. What a great job you've done! It's beautiful, Leslie...just like your smile and your spirit! Oh I did! It's beautiful! You have such an eye for beautiful my friend. I'm sure our Heavenly Father smiles as He looks down on your beautiful self! Wow! What an amazing room! Great job; you are so talented! I'm going to come back to this post, over and over again, for inspiration! 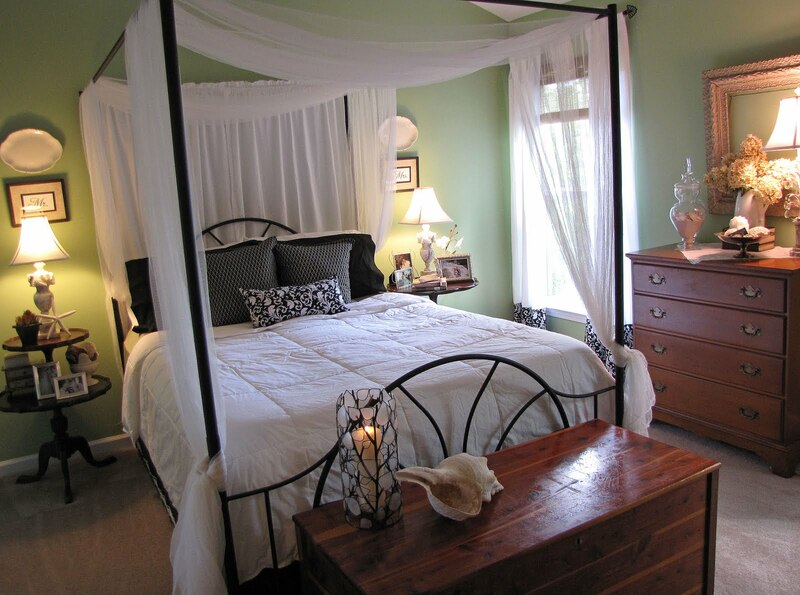 Your bedroom turned out soft and romantic! The island theme is beautiful. I love those side tables. Leslie, I love your room. 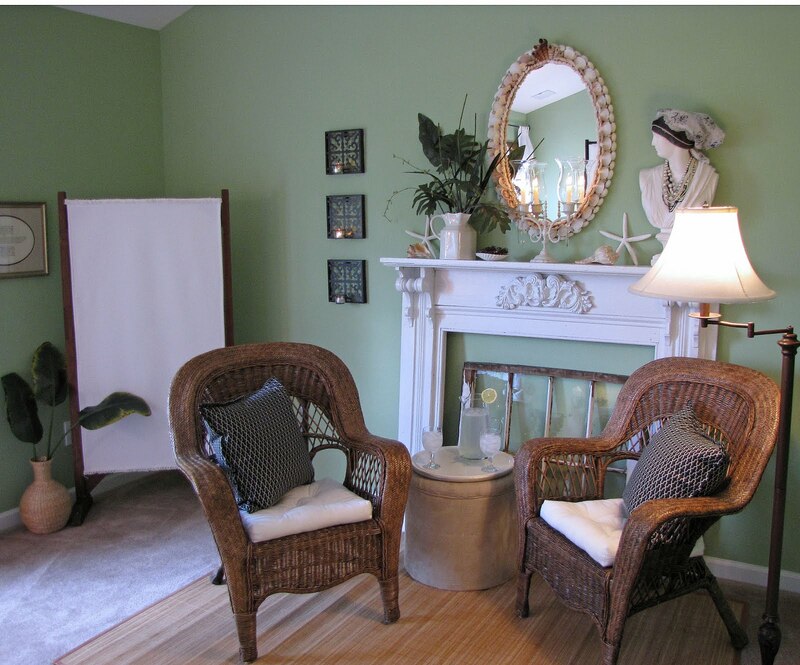 The soft green paint is the perfect backdrop for the look you have. I really like the symmetry on the sides of the bed with the tables, lamps, and plates on the wall. That mantel is to die for!! WOw! The colors and the natural elements really invite you in. 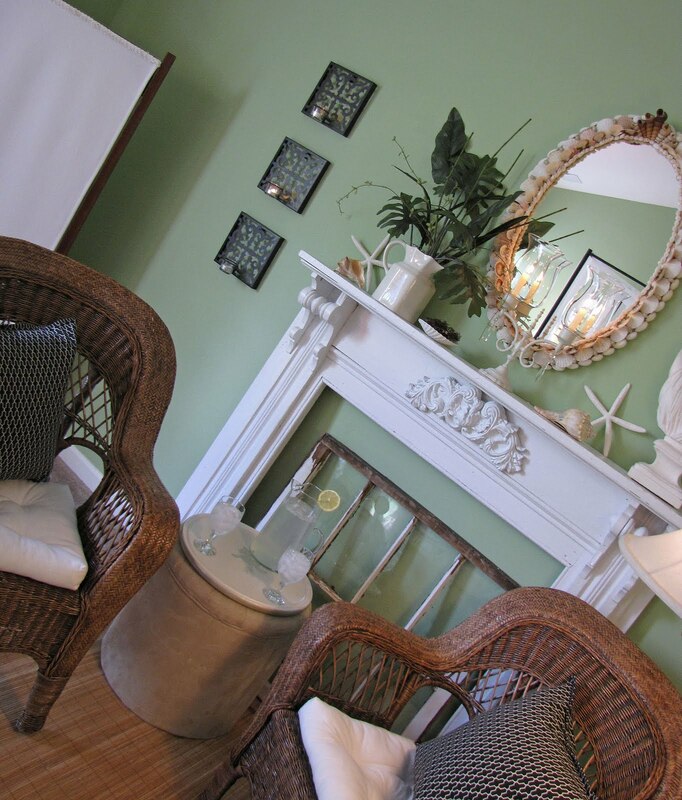 The mantle and wicker chairs and all the family heirloom pieces, your accessories....it's a lovely room! What an inspiring room with lots of great ideas. Thank you for joining the parade of bedrooms! Good Job, I especially like the drinks in the corner. Are you going to set out new ones each day ;)... j/k It looks great, and I'm sure Mr. Mark loves it to. What a nice little "getaway". So pretty, Leslie! I adore seashells too, your room looks like a wonderful retreat. And those lamps, oh those lamps. I have to find a pair of those one day. You've put together such a calming room, I bet you never want to leave. 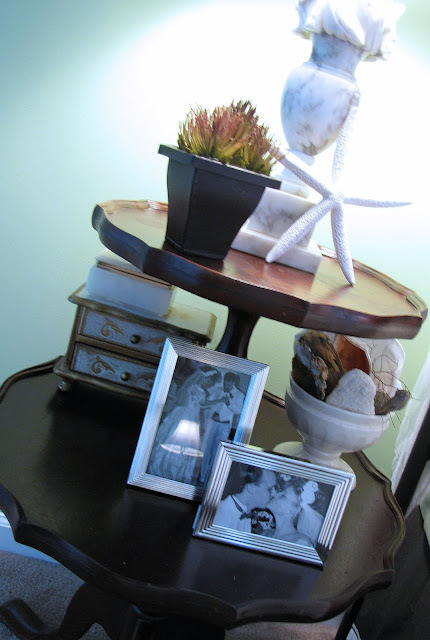 So PRETTY...love all the beachy touches...just my style! I also love the sitting area with the mantel and window...great idea! Very pretty, Leslie! What a nice soft room to begin and end the day in! 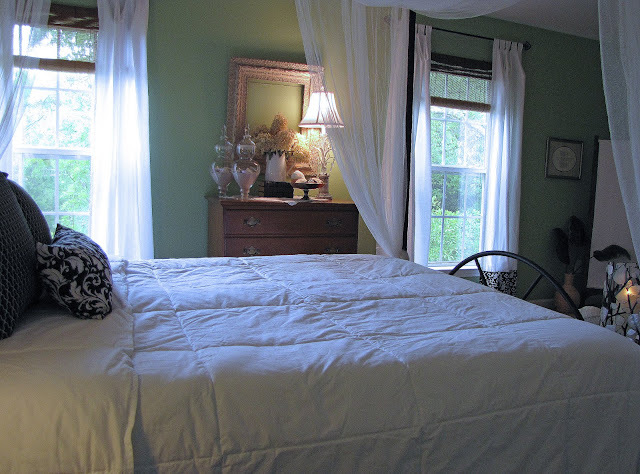 Love the fabric draped softly over the top of your bed. OMGosh, Leslie...this is just stunning. I can see that ya'll must feel like you are on an island getaway every time you go into this BEAUTIFUL room...I am so so impressed. 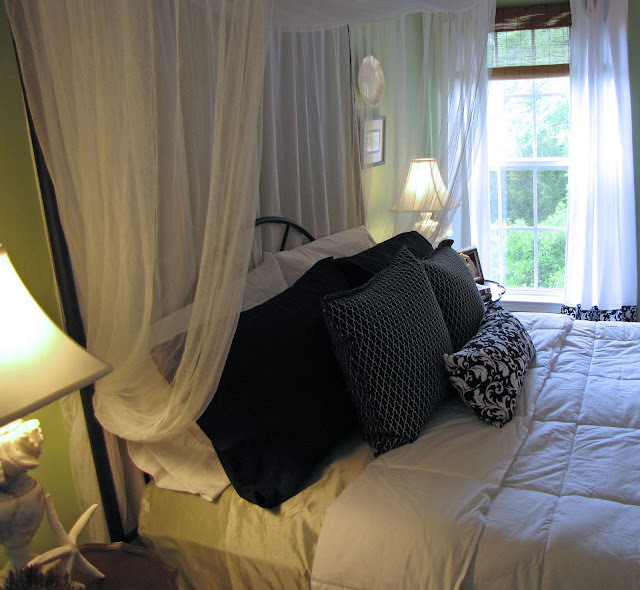 Leslie, your blog is new to me...Love the name, and I love your bedroom. Such special touches that you've added! Thanks for sharing! First time to your blog and how funny we live in the same town. Your bedroom is just lovely. I love all the white and the many special touches that you have added. It looks so beautiful and relaxing! I think I might just have to use the Mr. Mrs. frame idea! Absolutely beautiful bedroom. The color scheme IS similar to mine; kinda cool to see it decorated with same colors/different style. I love the solid black pillow you used. I think I need to steal that idea. They add a sense of drama. great makeover! I was wondering if you noticed a shadow of a cross on the chest at the foot of your bed (in the sunlight). It caught my eye. Love your room! Such detail and I love how so many pieces have such meaning. What a delightful room. SO much inspiration. I'm going to hunt for an old mantle! I really enjoyed your bedroom. Thanks for sharing. It does have that island getaway feel. That mantel is fabulous. Honeymoon SWEET! It all looks so lovely, Leslie. But it is the thought and details that make it just perfect. I LOVE this room! It is so well done. Every detail looks just perfect. I love the lamps and the Mr. and Mrs. signs. Such a romantic room! Thanks for stopping by my blog and for the super sweet comment! I LOVE you room. I love shells and starfish, so I was sold ths second I saw those! But seriously it does looks like a Jamacia getaway - with the colors, furniture, white drapes, etc. 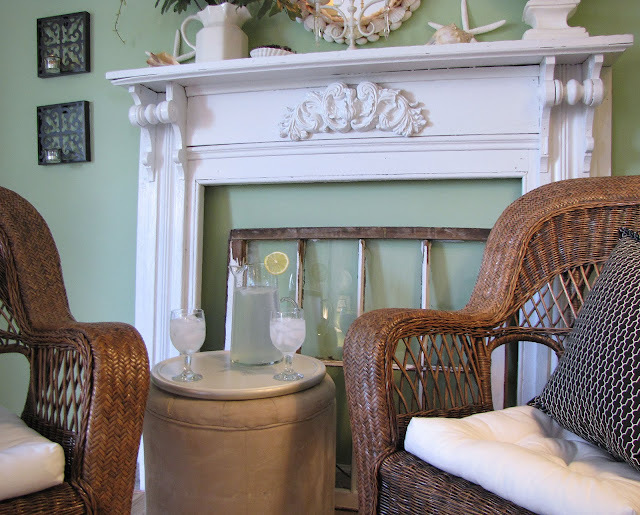 Leslie your master retreat is truly a retreat!~ I loved the mantel with the window leaning inside the opening, so clever, and all your beach touches and special gifts are so pretty! Leslie, you room is beautiful, absolutely gorgeous! I love all the special touches you incorporated in the room. The mantel is wonderful, as well as the screen in the background. You're a fabulous decorator! Your makeover looks great, I am a fan of green and white. I love the mantle. I am sure you are both going to enjoy the peaceful room. I am your New Friend Friday! I adore your bedroom, and I hope I can reach that perfection one day, even if for a moment! Everything is so peaceful and placed beautifully. It has a true beach feel without the kitsch. I look forward to reading through your blog and getting to know you a bit. I hope you'll visit me! This is just breathtaking! 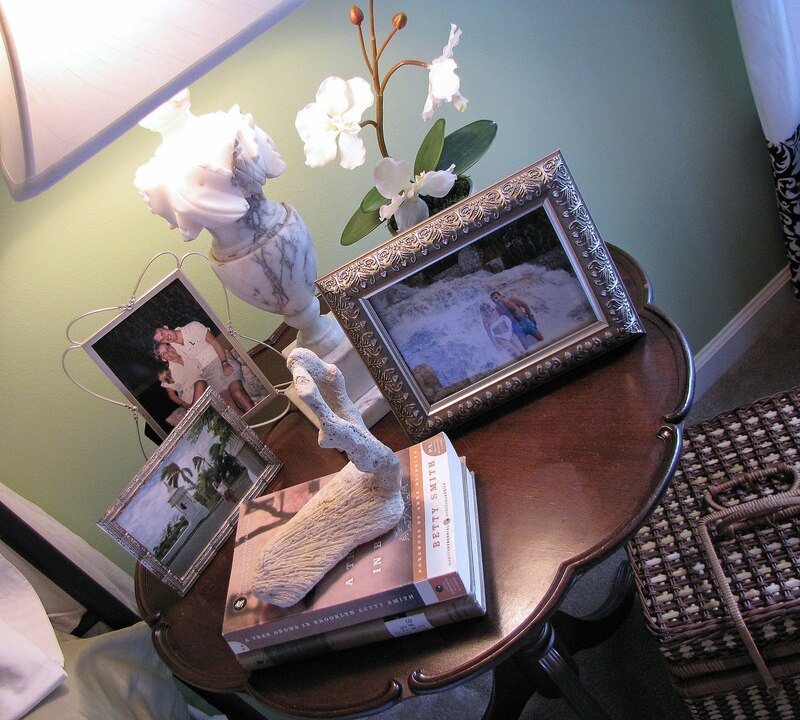 Love your style and all the little details you put throughout the room. Looks like a paradise. Gorgeous! Stopping back by to say thanks for joining me. I returned the favor. We definitely have kindred spirits. My master has a touch of beach theme too. Also, like you, I just want to be in Jesus' presence when I die. I'd trade that ride for a chariot to Glory any time! Have a blessed weekend! WOW WEE! That is one awesome bedroom. I would love to have a room like that but then I might not want to ever leave. Your style is beautiful! You have created a beautiful room with so much detail! I really like the framed words at the end of your post, so wonderful! Leslie, your room looks like a beautiful retreat at a resort!! Everything about it looks so peaceful and calm. I especially love the Mr. and Mrs. framed next to the bed. The tables and lamps are so cool and that they have been passed fown like that in your family makes them so special. What a beautiful room!! I love the bed. You have inspired me to work on our bedroom. Blessings. It's absolutely beautiful!! I love the breezy, comfortable ease of it. Hi there. I found your blog through Friday Follow. If you would be interested in becoming a follower of my blog, I would gladly follow you back. Stunning! You put together such a peaceful, beautiful room! Thank you for sharing it with us. Love it. Makes me want to start over with mine! This is one of the most beautiful bedrooms I've seen. It is stunning. Your vignettes around the room are perfection. Thank you for the much needed inspiration. It is beautiful! GORGEOUS!!!!! It's like an expensive getaway cottage. Beautiful! What a great room! I love the colors and the feel of the room! You have some very beautiful pieces of furniture; I am in love with those lamps and the tables. How special they came from a family member too! Such a gorgeous room transformation!! You did such a great job with placing everything and making it all cohesive but not too matchy-matchy. I also LOVE the wall color! Wanted to say thanks so much too for the sweet and encouraging comments lately...you are a dear! What a beautiful bedroom. It is so romantic and elegant. I am a new follower and will be back soon. Hope you have a chance to come say hello. I saw some of this bedroom in another post. Love getting the whole tour! I would also love to capture the feeling of an island in are bedroom, heck I would like it in the whole house. Yours is gorgeous! I really love the canopy over your bed. That is the one feature that really says tropical! Wow! Turned out beautiful! Love the Mr.& Mrs. signs, cute! What a beautiful room. You really have an eye for detail. 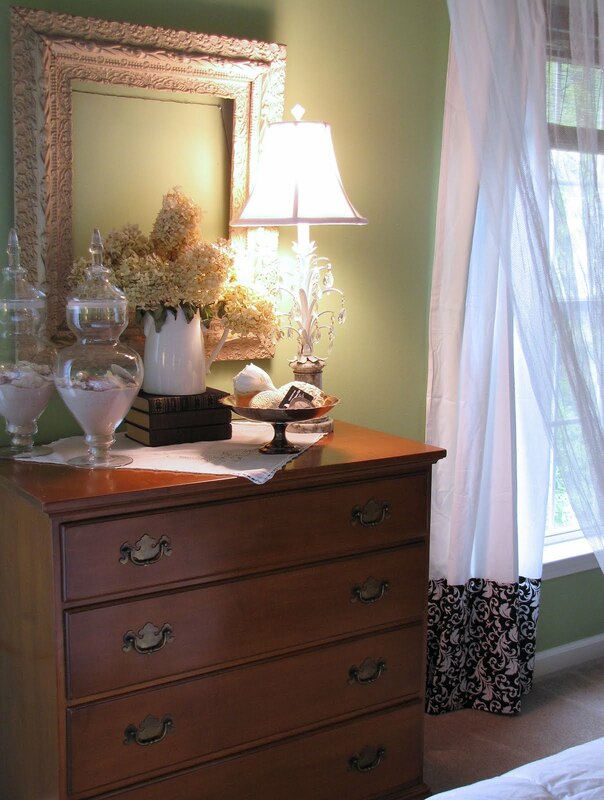 The lamps are gorgeous & I love the Mr & Mrs prints above the nightstands. Such a beautiful space to share with your husband. This is exactly the look I want for our master bedroom. Perfect! I think I will follow you! I also added this as a link to my "dream house list". Love it! Love the room, so peaceful and serene. I am so inspired each and every time I come to your blog! 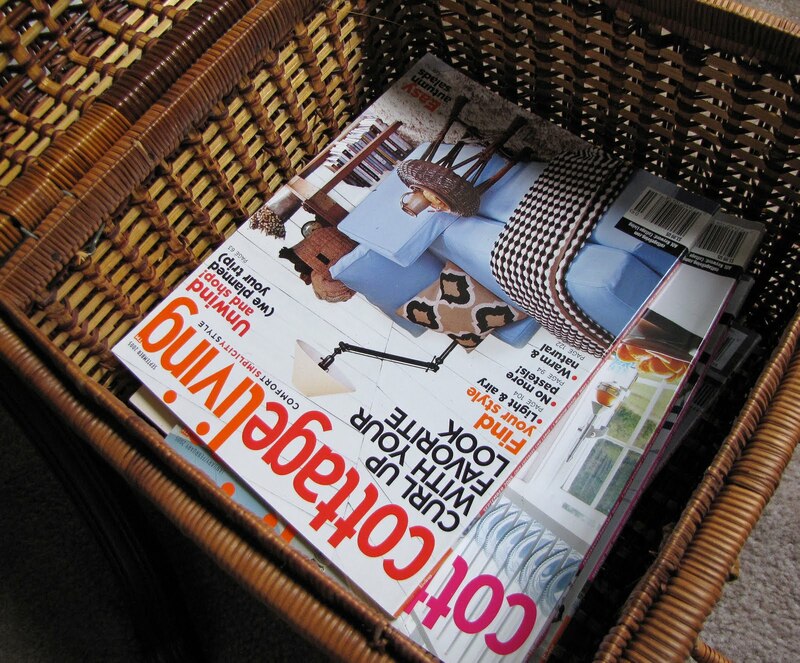 It's like opening the pages of my favorite decorating magazine,except much more doable for someone as o.d.d as me. (obessive decorating disease). btw..thanks for the award. Getting caught up on blogging and reading will post on my blog today. What a dreamy room! I love it! Fantastic job. Enjoy it!! so pretty, so calming! I love that many things have a story and meaning to them. Thanks so much for sharing at "AP tuesdays! What a serene and inviting space! 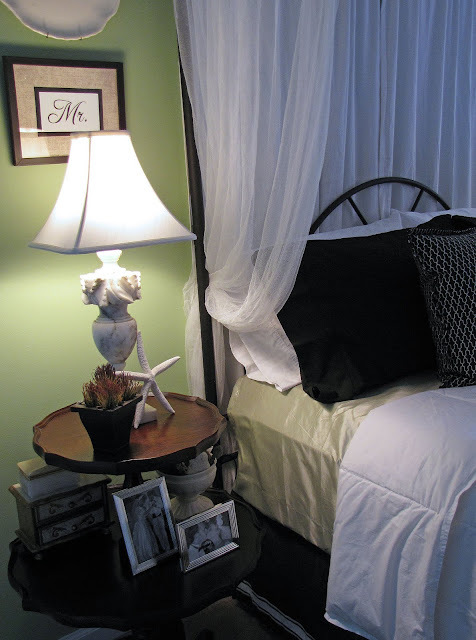 I love the Mr. & Mrs. frames on either side of your bed ~ what a fun idea! What a beautiful and peaceful bedroom! 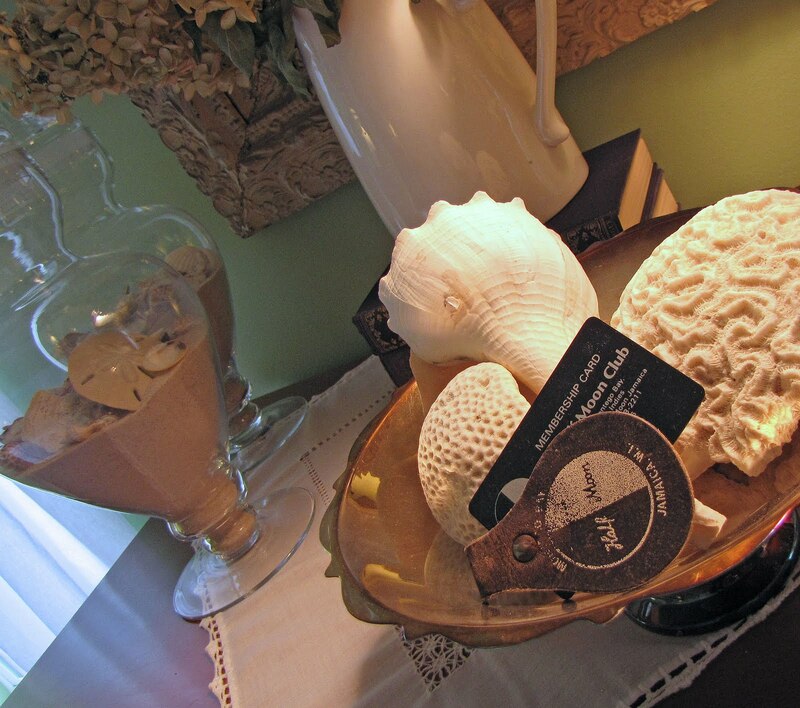 I also have shells and sand from various beaches on display. I love Cottage Living too, but I had no idea they weren't printing it anymore. Love your master bedroom err retreat rather! I wish I could do something like this, however I rent currently. I am cherishing your ideas for the day I purchase my own house. :) Hopefully I will be able to do that in the next 5 or so years. I came by your blog via Dustine. I went to college with her and high school with her husband. Can't wait to visit her more often! Your bedroom is just gorgeous! Thanks for the info on the paint, don't worry about trying to find a matching sample....I was just hoping it was something still out there. I have a green color I may be using. I loved Martha's colors, and she kept moving around--kmart to Sherwin Williams and now I think she may be at Home Depot and she has changed colors I think....not sure as I have not gone to Home Depot as it is not convenient. I love it! It's gorgeous, of course. I've never even been on an island getaway, but am hoping to do something exotic-inspired such as that when we get to our new home! Thanks for the inspiration! I enjoy your picture of Eph. 5, is that an original idea or does someone make these?